Ah, the sounds of summer–buzzing weed whackers, heaving breaths as we struggle to blow up swim rafts, and the metallic tinklings of the ice cream truck tune. We just missed it the other day as our echolocation on the dulcet tones told us he (It’s always a he, isn’t it? I’m not sure about the legalities of an all male workforce. Is that a bona fide occupational qualification? Oh sorry, I drifted off into the mind numbing intricacies of labor law. Back on track now.) was headed in the other direction. Since then we have been stalking Mr. Softee. We have $18 in quarters in a Ziploc baggie awaiting his return. I don’t know what Mr. Softee charges these days, but 2 vanilla cones adjusted for inflation is surely under $9. Tuesday, it happened. I bailed mid-sentence on a conference call, feigning chest pains and sounded the alarm. Man your stations! Ziploc bag in hand, we sent Gus out on reconnoissance. He ran around the corner and back, “He’s close.” But is he coming this direction? Back to check. “Yes, he’s moving this way.” But what if he turns before our street? Back up the hill and around the corner to signal his desire. By this time we could have all leisurely strolled up to meet the truck where it was. That’s not the point. The beauty is frozen fatty goodness on demand, delivered right to you. No exertion needed. Fetch me a soft serve, man-wench (mench?). The sounds were growing louder. It was like counting the seconds between lightning and the thunder clap–audio confirmation of approach. Then we locked in the visual. The top heavy truck ambled up the street. I stepped up to the curb and signaled the intent with the nod of my head, lest he think I was out there for the mail. This deal was going down. My street, my terms. I stepped up to the window momentarily dazzled by the selection. Two spiraling towers of ice cream in a wide-load cone? Whoa! And then gathering my maternal wits about me, I stepped like a bulwark between my children and whatever display of ink, piercings, and state of dental hygiene might appear. Let me handle this. Holy waffle cones! 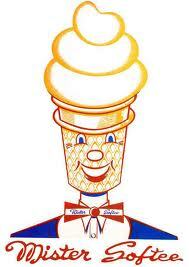 Mr. Softee was hot. I mean not just free-of-a-house-arrest-ankle-monitor-and-ZZ-Top-beard passable. I mean a prep school buck with a tan and a gleaming smile. A sort-of Ryan Gosling slinging frozen dairy goods. He took my quarters with a wink and delivered 2 gravity-defying twists of vanilla heaven. My nanny and I exchanged glances with an implicit, “Did you see that?” We’ve been waiting with our quarters ever since. This entry was posted in Shout Outs and tagged ice cream truck, mr softee, sounds of summer by blmilhizer. Bookmark the permalink.